Set a New World Record!! 151-way Formation!! This event is organized by women and performed by women to SAVE women! Emmy Award Winner for Outstanding Writing in a Children’s Series and skydiving enthusiast, Mallory Lewis, founded Jump for the Cause after her mother, legendary puppeteer Shari Lewis, lost her battle with cancer in 1998. After incorporating the organization in 1999 with Brad Hood of Jump Run Productions, with Kate Cooper and Tony Domenico of Square One Parachute Sales, Lewis wanted the first official event to be in honor of her mother. Over a six-day period at the Women’s World Record Skydive, Lewis and participants raised more than $300,000 to fight breast cancer and set a new world’s record by joining 118 women in formation in mid-air. 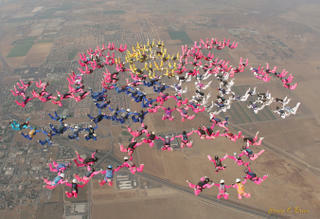 In 2002, 131 women raised another $400,000 for the cause in their successful world record jump. “The first year was emotional because of the tribute to mom, but this year I am thrilled with the passion and commitment these women continue to show to support breast cancer research at City of Hope,” said Lewis. “This event is organized by women and performed by women to SAVE women. The money we raise is helping to bring hope to many people around the world,” she added.